ERIC AND THE BUNNY BOILERS + guests LIVE at THE FLYING DUCK, 142 Renfield Street, Glasgow, G1. Thursday 14th June 2018. Doors 7pm. Support from THE LONERS + DOGSTAR WANDERERS. 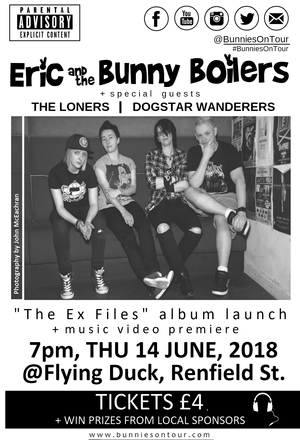 Join ERIC AND THE BUNNY BOILERS for a night of live music and the premiere of their new music video for "The Psychopath Next Door". Prizes up for grabs from local sponsors. Tickets £4.00. Subscribe to updates for the latest ERIC AND THE BUNNY BOILERS gig news!